At Waukegan Medical and Rehabilitation, we are proud to be your local Waukegan chiropractic and wellness resource. Our chiropractor, Dr. Bracic, has been working as a chiropractor for more than 20 years, and started the clinic in 1994. We serve a large client base from all around the Waukegan, North Chicago, Park City, Beach Park, Zion, Round Lake, and Gurnee areas. We are proud to serve a very diverse group of clients, and we speak both English and Spanish for the convenience of our patients. 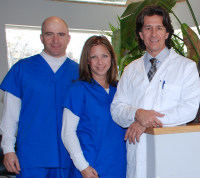 The primary focus of Dr. Bracic and our entire staff is getting people free of pain. To do this, we use what is known as a “whole person” approach to healing. Our staff is made up of a variety of health care practitioners, so that we can help patients with a wide range of physical and mobility problems. We have a medical doctor, registered nurse and a physical therapist on staff, and our care providers work with Dr. Bracic when needed to give patients the best care for workplace injury, auto injury, sports injuries or other injuries that may require a multi-disciplinary approach. Chiropractic treatment, physical therapy and strengthening exercises can all work as components of a total care plan. Dr. Bracic is experienced in a range of chiropractic techniques. Traditional spinal manipulation is often one of the first physical medicine methods used, but many patients will benefit from methods such as the K laser treatments. K laser treatments are class 4 laser therapy treatments that can help in pain management and healing. Other chiropractic techniques include the Cox and Graston techniques, both specialized manipulation methods, and the use of Arthrostim adjustment instruments. Our physical medicine treatments include trigger point injections and joint injections. Both of these injection types are used to provide pain relief in the specific areas. In cases where the patient is experiencing pain that is more severe than is common for the injury, this type of injection can provide immediate pain relief and help. Chiropractic and medical treatments may often be combined with physiotherapy such as moist heat therapy, cryotherapy, or electrical muscle stimulation. These complementary, natural healing treatments are sometimes helpful in speeding up the healing process and in helping to increase the pain relief. Additional techniques such as massage and yoga may be used for increased relaxation and help with the healing process. We offer a wide range of physical medicine treatments because we have a wide range of patients — and each patient has a unique injury that needs specialized treatment. Whether we are treating sports injuries, chronic pain like arthritis, or sudden injuries such as car accident injuries, our chiropractor, physical therapist, medical doctor and our whole staff are highly trained in helping each person heal.